I’ve had an ongoing fascination with first national park and semi-Tarai regions in Nepal, the home of wildlife. What activities doing there? How do their citizens define themselves? I learned more about this on two nights three days trip from Kathmandu to the Nepal's first National Park, completely surrounded by dense tall elephant grass interspersed with reverie forests of silk cotton trees. I’ve always wanted to visit Chitwan Park, and bathing by elephant best opportunity I’ve had so far. Chitwan is 5 hours long bus ride from Kathmandu, or 20 minutes flight to Bharatpur than drive to park. Chitwan national park is most famous wildlife park in Nepal. Chitwan is perched on top of a mountain dwarfing the flat landscape. You’re dropped in a picture-perfect town Sauraha. Chitwan National park, a UNESCO World Heritage Site, claims to be the world’s oldest National park. Wild animals continue to rule the national park from these absolutely beautiful floodplains of Narayani, Rapti Rivers. I love the culture, and it’s not unexpected to see them in culture show in Nepal. What I did NOT expect was to see python and a one horn rhino. But I did. Asian Hiking Team sent Chitwan programs’ a letter during our communication, and he replied Canoeing, Jungle walk, Visit Elephant breeding center, Elephant Back Safari, Jungle Drive, evening walk, dinner and Tharu Cultural show. The words of his letter email are engraved on the bust except jungle walk. They never said to see Python. Although your dominion is small your state is nevertheless one of the most honored in all history. Then I took a look at the date: June 17, 2013. The Monsoon had just begun few weeks ago. Could you imagine what was going through his head when he wrote that letter? My favorite thing in Chitwan was elephant bath and culture programs, the elephant bath, ohoo, well very pleasure in Rapti river bank, we had a great time and thank so much the elephant which I took bath. But even better was the unforgettable culture group dance. “All the dance is control my drum”. If you do one thing in Chitwan National park, elephant bathing and join Tharu culture dance. Next up was a special meeting for jangle walking once told me, ohoo looks there !!!! The guide told us silent, silent. 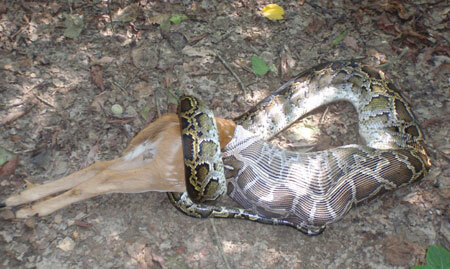 The python was eating deer. This was very less chance to see in our life. You can see in my picture was really scaring me. Chitwan jungle safari Nepal -python. Yes, there is possible to see One-horned Rhino, elusive Royal Bengal Tiger, Leopard, verities of Deer, Sloth Bear, Rhesus Monkey, Wild Boar, Jackals, Civets, Mongooses, Cats, Snakes and other reptiles, Crocodiles and the Extraordinary Genetic Dolphins, Bird-watchers delight with more than four hundred fifty migrant and local species birds recorded is Cormorants, Herons, Egrets, Storks, Cranes, Ducks, Woodpeckers, Hawks, Osprey, Falcons, Kestrel, Parakeets, Ibis, Kites, Kingfishers, Swallows, Orioles, Drogues, Babblers and many others. That’s the complete opposite to see one horn rhino and python in my life as well as we saw crocodile, dears, jackal and many birds, I did not remain the name. Can you imagine running Nepal’s first national park, yet famous for losing all the 3 days time? You have to have a healthy attitude to deal with that on a daily basis. And I think culture demonstrate that attitude. They graciously agreed to pose for someone Once Told Me, and Scott was thrilled. Culture shared a tweet that a fan sent him after a memorable Tharu programs attractive in Chitwan. Culture show would be in the next few weeks — keep an eye out for them! I left Chitwan — though I’m far from understanding what it’s like to be part of a country this small, I feel like I’m getting closer. What you Need? - Binoculars add greatly to your enjoyment for bird and wildlife viewing. Neutral colored clothing is recommended for a visit to the jungle. Light clothing is needed for day time from June to August, at that time is bit hot. Pants / Trousers are recommended for elephant safari. Comfortable walking shoes, sun hat, sunglasses etc. are essential. Most be bring insect repellent and personal medical requirements should be carried. This is a Blog by Nicole Jame Boyd, created and managed by Scott Steeg travel with Chitwan National park. AsianHikingTeam.com maintains full editorial control of the content published on their site.Many thanks to AsianHikingTeam.com for their support of the trip to Chitwan national park. All opinions, as always, are my own. Thanks - Nicole.